Yellow Corn Meal Enriched with Vitamins (Niacin, Thiamine Mononitrate, Riboflavin, Folic Acid) Iron, Salt and Leavening (Sodium Bicarbonate, Monocalcium Phosphate). Thank you for contacting us. Our 2Lb and 5Lb Dixie Lily self rising yellow corn meal is degermed. However, all of our stone ground corn meal products (Dixie Lily, Arnett’s and Alabama King) are not degermed. If you ever have a question, you can look on the ingredients list and it will say corn meal (Which means that it is degermed) or whole kernel corn (Which means that it is not degermed). Also the product will say 100% whole grain if it is not degermed. We hope this helps and we appreciate your business. 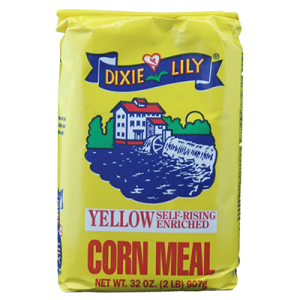 Is “Dixie Lily Yellow Self-Rising Corn Meal” gluten free? It is unclear from the list of ingredients, you just say “meal”. Sometimes meal means wheat is added. You should clarify that on the label. Thank you so much for contacting us. Corn is gluten free in nature. However, we do not sell any certified gluten free corn meal. Our corn meal products are not certified gluten free due to the chance of trace cross contamination on the farm, storage facilities, packaging facilities or during transport to us, our packages or our suppliers. The only product that we sell that is certified gluten free is our yellow corn grits. We hope this helps and we appreciate your business. 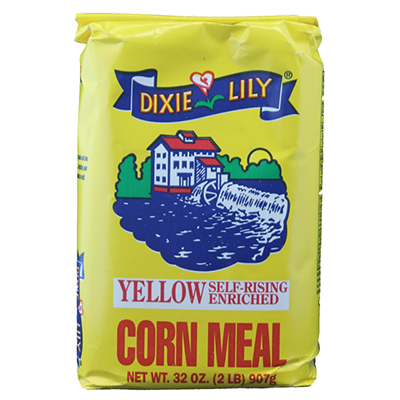 I would like again to purchase online Dixie Lily Yellow Self-Rising Enriched Corn Meal. Thank you so much for contacting us. You can find all of our corn meal products online at https://southerntraditionalfoods.com/. We hope this helps and we appreciate your business.